One of the things I find the hardest about being at university is finding a balance. It's so easy to fall into bad habits of buying takeaways, going out every night, sleeping in late etc, but it's also really easy to go the opposite way, studying in the library till 2am every night, rushing around and never really taking a break. So when the lovely Daphnee from Unibox contacted me to see if I would be interested in receiving their September edition, "Back to Unibox" I was really intrigued and of course said yes! 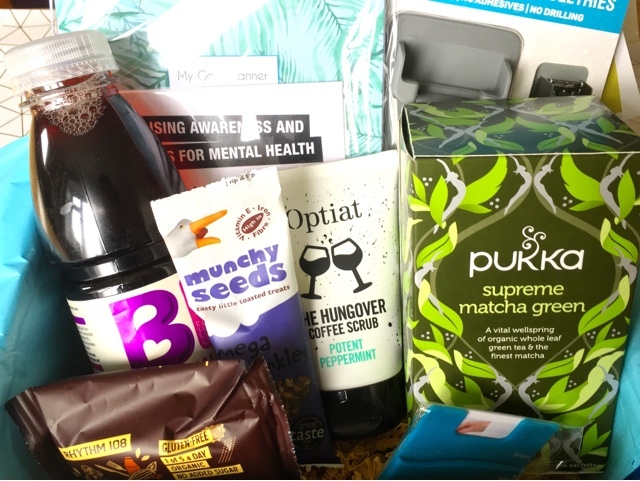 There are loads of monthly subscription boxes out there, but this one is designed especially for students, with the aim of providing products that encourage you to find a little more balance. Think healthy snacks, stationery and other bits and bobs to make life as a student easier. I love the concept behind the box, receiving a monthly little pick me up to help refocus and get back on the right track sounds great! Each box contains 6-8 full sized products and there is something just so exciting about getting a package and just not knowing what is inside. The Unibox Goal Planner: A Supercute palm print (very on trend) goal planner which to me has some bullet journal vibes but with a bit of direction. It has space to write your goals and reflections but also a handy little habit tracker section which would be really cool if you wanted to track fitness or water intake for example. The Unibox Card Holder: Perfect for sticking on your phone so you never lose your student card again. So handy for nights out when you might not want to take a jacket but need your ID card to get in to the union or wherever! Pukka Matcha Green Tea: I was really excited to see Pukka teas in the box as this is definitely a product which I would never really buy for myself. Pukka teas are quite luxurious as a student and I normally stick to Tetley. I've never actually tried matcha tea so I'm looking forward to giving it a go! Maison de Choup Warrior Patch: I love that Unibox is working with a charity and this is an issue which affects so many students so it is really relevant. Maison de Choup fashion brand was founded by 21 year old George to raise awareness and support young people suffering with anxiety and mental health. This fun patch can be stuck on jackets or rucksacks or wherever really and 25% of the proceeds go to YoungMinds, the UK's leading mental health charity for children and young people. Be raspberry, blackcurrant, beetroot juice drink: Fairtrade, lots of berries and one of your five-a-day, I always find juice drinks a good way to help incorporate more fruit and veggies when I'm at uni. Opitat Hangover Scrub: Anything that claims to cure a hangover is definitely worth a shot in my book. I didn't think it would be fair to test this on a normal day so in the name of research, I took myself on a night out just to try it the next morning. (Or so I'll tell myself anyway....) The peppermint scent is pretty strong however it actually did leave my skin and therefore me, feeling a little more refreshed and ready for the day. I think my skin really enjoyed it too as it felt nice and soft afterwards. Munchy Seeds: I'm not usually a big fan of seeds but they undeniably carry great health benefits, so I will try and incorporate them into my salad next time I'm making one for lunch. As they are packed with nutritious benefits, it furthers Unibox's idea of creating balance at university. Rhythm 108 chocolate brownie: This looks like the perfect snack to pop in my rucksack and bring to the library for when I'm needing a boost. You can even warm them up to eat at home which sounds delish! The mighty razor holder: I love the idea of putting something useful for the home in the box too. I already actually have a razor holder so I'll probably be giving this one to W, but they are super handy and stop the blade getting gooey from sitting in water. Overall I was pretty impressed with the products I received in the September Unibox. There was definitely a good mix of unisex products and I love the fact it has something for all aspects of student life, from healthy snacks to stationery to something for your student flat. The theme of the October box is "Hocus Focus" which sounds like it will contain some great stationery and things to help you knuckle down as the deadlines begin. 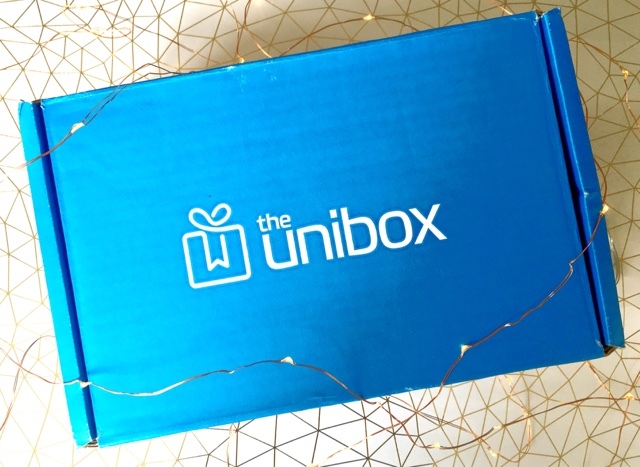 Click here to find out some more information about Unibox and to subscribe to their next box. You can also use the code: BLOG5 for £5 off. Let me know in the comments if you get any subscription boxes to help you whilst at university and what you think of the products inside this one! I didn't even know this was a thing... I honestly think I might buy this to send to my sister who's just started Uni! LOVE the idea of these boxes, I would be over the moon getting one of these a month as I find it so hard to stay motivated at times! Hi, the subscription box market seems to rapidly expanding this another great idea full of little treats. That Goal Planner sounds amazing, I love the sound of Uni-box it's such a cool subscription!